Just as its important to take your child for regular check-ups at a paediatrician, so too is it vital for you to bring your infant to the dentist, particularly as their first teeth begin to grow. This also helps your child to become familiar with dental check-ups, helping to overcome potential anxiety from a very young age. We love gifting all of our new patients with their very own oral hygiene kit, and that includes our youngest patients too. We believe one of the best ways to help your child become familiar with visiting our practice is to bring them along for your dental appointments too. This allows them to gradually become accustomed to being in our environment, without being overwhelmed. Our warm and friendly team pride themselves on making dental visits a fun and enjoyable experience. We’ve even been known to offer free rides in the chair! 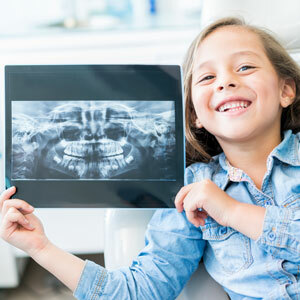 When it’s time for your child’s own dental check-up at Green Apple Dental Clinic, we also like to screen for potential oral health concerns, allowing us to address the issue before it becomes a more complex (and therefore, more expensive) issue. This government program provides up to $1,000 of private dental treatment over two calendar years for children between 2-17 who meet the eligibility requirements. If you are not sure if your child is eligible, please contact the practice and provide your Medicare number and we can check eligibility for your child. It’s our goal to help your child have a healthy, beautiful, and confident smile that will last a lifetime. We put your child’s needs first to deliver high-quality dental care resulting in excellent oral health. Contact our practice today to schedule your child’s first check-up with our experienced and kind dentist!